Devoted To Our Clients. Delivering with Passion. ecfirst, home of the HIPAA Academy™, offers the gold standard in compliance training and certification. The HIPAA Certified Security Compliance Specialist™ (CSCS™) and Certified HIPAA Professional (CHP) certifications are the only certifications recognized in the Industry. The ecfirst Certified Security Compliance Specialist™ (CSCS™) Program is the first and only information security program that addresses all major compliance regulations from a security perspective. 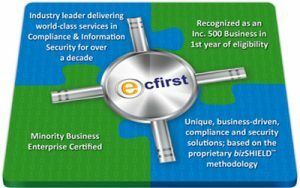 ecfirst delivers world-class information security and regulatory compliance solutions. With over 2,000+ clients, ecfirst was recognized as an Inc. 500 business – America’s Top 500 Fastest Growing Privately Held Business in 2004 – our first year of eligibility. ecfirst serves a Who’s Who client list that includes technology firms, numerous hospitals, state and county governments, and hundreds of businesses across the United States and abroad. A partial list of clients includes Microsoft, Symantec, HP, McKesson, EMC, IBM, Principal Financial, U.S. Army, U.S. Dept. of Homeland Security, U.S. Dept. of Veterans Affairs and many others. The ecfirst Regulatory Compliance Practice delivers deep expertise with its full suite of services that include; HIPAA Privacy Gap Analysis, Meaningful Use Risk Analysis, HITECH Data Breach, Technical Vulnerability Assessment, Policy and Procedure Development, Disaster Recovery Planning, On-Demand Consulting, as well as managed security and IT infrastructure solutions. ecfirst combines state of the art tools, the highest credentialed staff, and reporting that maximizes value, efficiency, and information for our clients to deliver the industry’s best technical vulnerability assessments. Talk to ecfirst and you will find an organization that is passionate about the services we deliver and exceptionally devoted to its clients. We deliver value with intensity and are confident about our performance with your organization. Ali Pabrai, chief executive of ecfirst is a highly sought after security and compliance expert. He is also author of the executive brief Cyber Security Strategy: The 4 Laws of Information Security. Pabrai was the first to launch a program focused on global information security regulations, the Certified Security Compliance Specialist™ (CSCS™) program. The CSCS™ program addresses PCI DSS, FISMA, ISO 27001/27002, FISMA and other security regulations and standards. 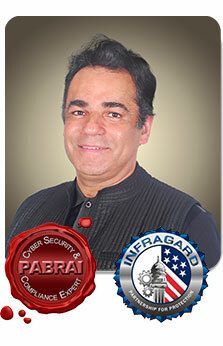 Pabrai is a proud member of the U.S. FBI InfraGard. ecfirst is a leader with rich hands-on experience delivering Information Technology (IT) and Regulatory Compliance solutions. ecfirst specializes in bringing you exceptional value with its full suite of services that include managed security and IT infrastructure solutions. The ecfirst business model is client-driven. Every engagement with our client results in a delivery team that brings in not just expert domain knowledge but exceptional industry and associated regulatory compliance experience. You will find us to be an organization that listens intensely to understand your challenges. We will work closely with you to develop a proposal and a solution that meets your requirements. Our proposals are typically delivered within 1 business day and are constructed to deliver exceptional value including fixed price, a flexible engagement model and a single point of contact. Welcome to the ecfirst Resource Center! A partial list of who’s who ecfirst clients includes EMC, IBM, Principal Financial, U.S. Army, U.S. Dept. of Homeland Security, U.S. Dept. of Veterans Affairs and many others. Call us at +1.877.899.9974 x23 (or +1.515.444.1221) to discuss your IT challenges.